Just this episode to go before the ticker-pumping, time-defying, zillion-effects, end-of-season, two-part finale. And what does writer Matthew Graham have in store? "It's really quite a creepy story, which hopefully will tap into psychological fears — a bit like 'Are you my mummy?' did," he says, referring to last year's story The Empty Child. "There's something iconic [in this week's episode] to do with things that children have in their bedroom, that could be rather scary if we get it right." Precedent suggests that they will. Doctor Who is having the Tardis pitching up at the bottom of your garden, or at the end of the road, and that's what the storyline taps into." Matthew Graham is no stranger to what makes drama work. He has written for EastEnders, This Life, Spooks and Hustle, and co-created Life on Mars, another time-travelling hit. He was also privy to executive producer Russell T Davies's first pitch for the new Doctor Who. "It was something like 'a boy and a girl running across the universe, having fun in time and space'. Everything about it was designed to make you think this was going to be fast and about friends facing adversity together — not about a ighly sophisticated 900-year-old being with two hearts and his immature, naive, earthbound sidekick. Doctor Who is oyes ilo with heart under Russell." Davies's approach to the sh clearly one that suits Graham. so light and effortless," he say the more you watch, the more realise that that's the only wa You don't need any more pm science fiction. You just want that fun, and it connects so with the audience. "It's the best Doctor Who Because of the heart. Christo Eccleston is a fine, fine actor, but don't think you would ever say that main talent as an actor is his effortil charm. Whereas David Tennant at man is effortlessly charming, and a'. the Doctor— and in any role he phis — he brings lots of warmth and childishness to it, without losing his dignity. The story was a joy to write." Caption: SSHH, YOU KNOW WHO! It's Rose (Billie Piper) and the Doctor (David Tennant), of course, but will they have to tread carefully around young Chloe (above)? APA 6th ed. : Griffiths, Nick (2006-06-24). Unearthly child. Radio Times p. 10. MLA 7th ed. : Griffiths, Nick. "Unearthly child." 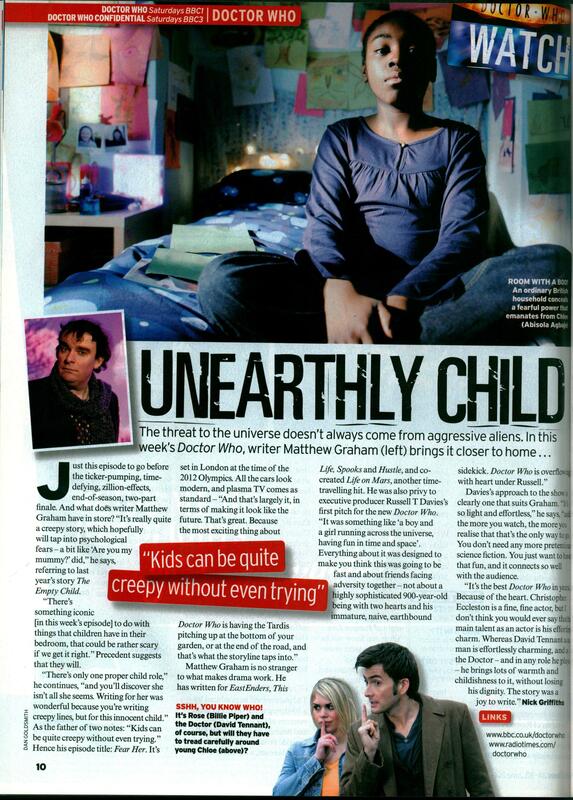 Radio Times [add city] 2006-06-24, 10. Print. Turabian: Griffiths, Nick. "Unearthly child." Radio Times, 2006-06-24, section, 10 edition. This page was last modified on 27 December 2013, at 02:23.